This study investigated the relationship between several measures of lower-body stiffness and physical performance variables in 22 sub-elite male football players (mean ± SD; 21.9 ± 1.5 yr; 1.79 ± 0.06 m; 72.2 ± 7.2 kg). The participants were assessed for individual muscle stiffness of the Rectus Femoris (RF), Biceps Femoris (BF) and Medial Gastrocnemius (MG) muscles and vertical stiffness (Kvert) was also assessed assessed running acceleration, maximal sprint speed, agility, vertical jumping and muscular strength. Pearson’s correlations quantified the relationships and participants were also separated into relatively stiff (SG) and compliant groups (CG) for each variable. 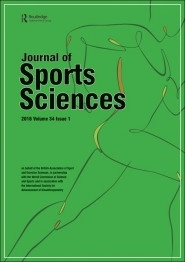 When ranked by Kvert the SG exhibited superior performance during sprinting, agility, jumping and strength (p ≤ 0.05) and when ranked by RF stiffness, SG exhibited superior sprint, agility and drop jump performance (p ≤ 0.05), while MG and BF stiffness were not related to performance. Higher stiffness appears to be beneficial to athletic performance for football players and therefore it may be beneficial for practitioners working with athletes that are required to perform dynamic activities to consider the contribution of stiffness to athletic performance.